Now that I'm a committed apartment dweller, I got to thinking about how popular apartments are these days, particularly in those areas close to the city. If people don't mind medium density living, they can be close to the city and near public transport. Back in the recesses of my memory, I recalled that the first high-rise apartment complex was Torbreck at Highgate Hill, built in the late fifties. A quick Google search soon dug up some facts: completed in 1960; built by Noel Kratzman; modern automatic lifts. Here is a drawing held by the John Oxley Library - the architects were from Brisbane, WH Job and RP Froud - and I assume that the drawing came from them originally. And here is one of the first photographs of the completed project, taken in 1963. When the building was under construction, there was no City Council legislation governing home units. The state government, then headed by Frank Nicklin, heavily supported the concept. As the project was developed before the advent of Strata Title ownership, buyers became investors in the Torbreck Home Units Limited company, and received shares based on the purchase price of their apartment. 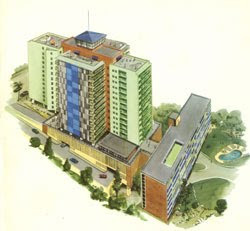 The promotional literature boasted that: "Each of the 150 home units was designed with at least one private balcony, and was fitted with built-ins, electric kitchen, two telephone connections (bedroom and lounge), sewerage and garbage disposal facilities, washing machine and clothes drier. Water, pumped from the city reservoirs to large storage tanks on the roof, was treated by the latest in American water-softening equipment. Television reception was available, and a swimming pool was constructed in the grounds." An interesting aspect to the project was that the slabs for the floors and roof were pre-fabricated and then lifted into place by cranes. One of the clever innovations that came from the architects was the installation of these vertical louvres to control light and heat on the decks that had eastern or western walls. 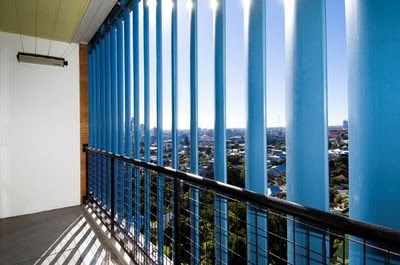 It is no exaggeration to say that this development paved the way for Brisbane's current apartment-mania. The prime position and extensive views made Torbreck popular from the get-go, and apartments there are still highly sought-after. Here is how the apartment block looks now. Fascinating place. I'd love to go up to that room at the top - it looks like some sort of viewing gallery. 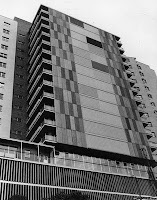 "Due to spiralling construction costs and/or lack of Brisbane City Council approval, some of the more elaborate aspects of the scheme had to be abandoned: shopping facilities and professional suites at ground level; basement laundry service; a top-class restaurant offering room service; a terrace cafe; roof and indoor gardens; and a tennis court, putting green and fully equipped children's playground. A planned rooftop observation lounge translated as an enclosed rooftop viewing deck." I lived in Gloucester Street, Dornoch Terrace runs across Gladstone Road, into my old street. Tram stop 13, Dutton Park line. I remember 3 very large houses along the top of Dornoch Tce were demolished, I used to go and watch the construction as a young paper boy. Does anyone know if the "lift-slab" design is being used to this day anywhere in Australia and if so, where and what methodology are they constructing with (e.g. how many floors)? I love how I get glimpses of Torbreck from various spots when travelling around Brisbane. My (then) girlfriend and I lived in various Torbreck apartments throughout the 1990's and even got married on the roof on a brilliant sunny November afternoon in 1997. Happy days!